BIKINI BODY MOMMY™ — POST-THANKSGIVING DETOX. CONGRATULATIONS! You survived Turkeygeddon ... Now it's back to reality! If you went as BIG yesterday as I did, then you probably woke up and haven't been feeling your best this morning. You're not alone, can you say "CARB COMA?!" Arrrgh. Not to worry Bikini Body Mommies, I'm dishing out my top 5 steps to help you detox and ditch the post-Turkey day bloat ... including a brand new fat-burning Bikini Body Mommy Workout! If you woke up feeling sluggish and bloated, then you should start the morning off on the right foot with my favorite de-bloating Super-greens drink that will help to re-regulate your digestion, and get you back on the Bikini Body Mommy flat-tummy track! This "Super-greens" drink is a simple way to not only get a jump-start your daily fiber, omega-3s, and other nutrients for the day, but it also helps with "elimination" (yes, going #2!) 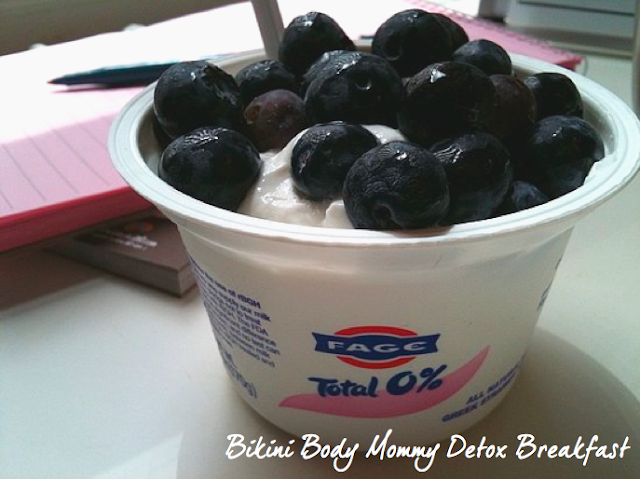 to get your bikini mommy body back in balance, and bloat-free! You only need three ingredients to make it, and don't worry ... the coconut water will help mask the taste of the Super-greens. Combine the Super Greens with the chia seeds and the the coconut water, stir for about a minute then drink it fast! Your first Bikini Body Mommy post-Thanksgiving meal should be energizing, and full of detoxifying ingredients to help you feel your best. Try making this greek yogurt with fresh blue and blackberries. There are tons of probiotics in the yogurt as well as antioxidants in the berries to help flush the toxins from your body! That's right Bikini Body Mommies, good ol' H2O is one of the best ways to help detox your body. 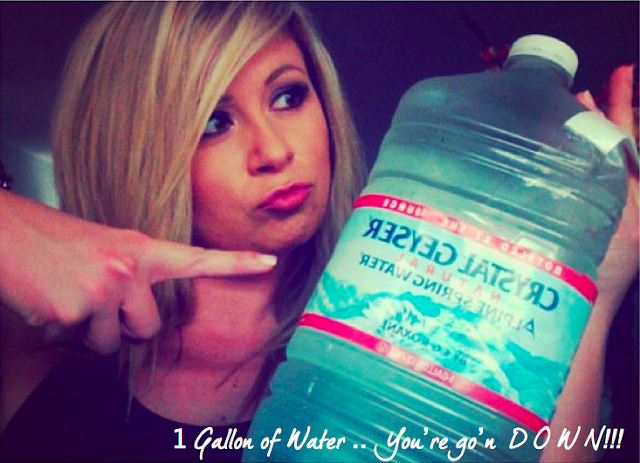 Aim to drink 1 GALLON today -- no if's, and's, or but's! For added benefit, you can throw in a few slices of lemon to help alkalize and flush out even more of the toxins. Heaping globs of gravy, mashed potatoes, pie, ice cream, and butter, butter, butter — Thanksgiving day was all about the fat, salt, sugar, and starchys! 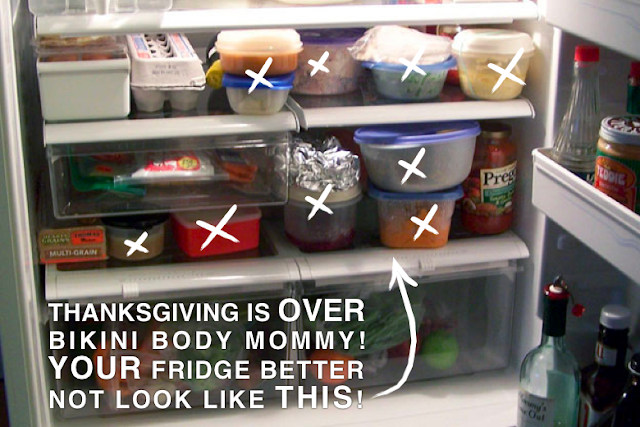 I SERIOUSLY hope you took the advice IN MY LAST POST and GOT RID OF ALL YOUR LEFTOVERS, because now that Thanksgiving is over -- it's time to reset your body! How you ask? I want you to go back to eating your fresh, clean "Bikini Body Mommy" approved foods as much as possible, which means going avoiding sugar, starchy-carbs, salt, and fat. When you think detox today, I want you to think fresh produce! Go for leafy dark greens, beets, carrots and pomegranate to help flush out your system today. One of the best ways to cleanse your system is to exercise! Do this Brand Spank'n NEW fat-burning Bikini Body Mommy Challenge workout after your Black-Friday shopping, to sweat it out, re-energize, and detox. You can put love into it, or hate into it today ... but it's the same number of reps either way. You Ready? LET'S DO IT!